Welcome to Brad’s Sky Stuff – a place where you can keep up with events that are up there in the sky. If this month’s full moon seemed unusually large, that’s because it was. On May 5, our closest celestial neighbor was just that – close. Known as a Supermoon, the May full moon was 221,000 miles from Earth (the average distance is 230,000 miles), making it about 14 percent larger and 30 percent brighter than other full moons of the year. Its slightly elliptical orbit causes the variations in the moon’s distance. Astronomers call the closest distance perigee and the furthest one apogee. If you’re worried about a Supermoon slamming into Earth, don’t be. There is absolutely no danger of such a cataclysmic event. This month’s apogee of the moon occurs on Saturday, May 19 when it is 252,000 miles from Earth. 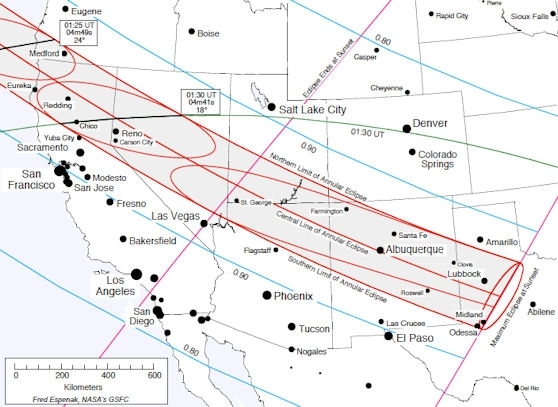 The next day, on Sunday the 20th, the moon passes directly in front of the sun, creating one of nature’s most breathtaking spectacles, a solar eclipse. Because the moon is furthest away from Earth, it won’t entirely block out the sun. Instead it will leave an annulus (ring) of sunlight around the moon. 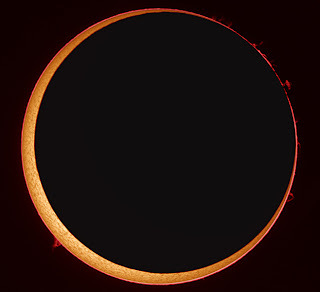 Fittingly, such an eclipse is called an annular solar eclipse. A total solar eclipse occurs when the moon is at perigee; the closer moon blocks out all of the sun’s light. Not all observers are lucky enough to witness this month’s eclipse as a ring of light. 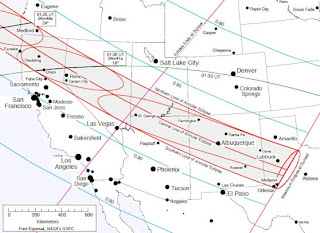 That privilege is bestowed upon those living within the narrow band in which the annular eclipse passes (See diagram to the right - those living within the red lines get an annular eclipse). Those living outside that band will experience a partial eclipse. The further one is from the band, the more partial the eclipse. Only about two hundred miles wide, the band stretches from Southeast Asia, across the Pacific, and angles Southeast across the Western U.S. ending up in Northwest Texas. For Kansans the partial eclipse begins around 7:30 pm and is still in progress as the sun sets an hour later. Viewing the eclipse requires a clear horizon and cloudless western sky. It is also possible to safely view a solar eclipse with a #14 welding helmet. Anything less than #14 does not provide adequate protection for your eyes. Remember if you do plan to observe the eclipse, safety is paramount. Unless you just like the idea of going blind, make sure you safeguard your eyes! Happy Observing!